For over a hundred years many historians were baffled and befuddled by many of the names in Yosemite and the surrounding area. That is because they were asking the wrong people for the definitions. 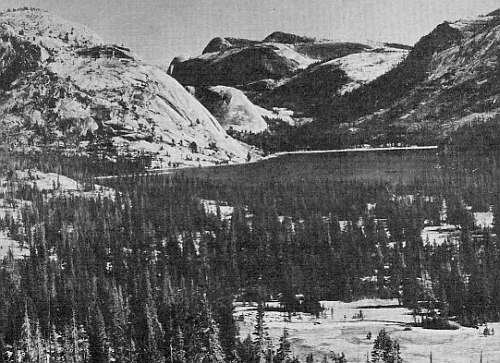 Old photo of Lake Tenaya, named after Chief Tenaya, or Tenieya, called Pa-weah to Mono Lake Paiutes. One of the names was for the famous chief himself, Chief Tenaya or Tenieya. Many historians depended on old text of early translations of European-Americans who many times guessed at the names around the area. A few times they asked later comers who came to area after the original Indians were vacated from the area. They still could not determine what Tenaya's name meant. Around the 1950s one person named Sylvia Broadbent sat down and spoke to people who she 'believed' were Southern Sierra Miwuks, but they were really Casson Yokuts. We know this because we Paiutes have viewed Broadbent's informants early family 1928 California Indian applications and other governmental records. Still no definition of Chief Tenaya's name. What historians and ethnologists were doing was they were asking the wrong people instead of reading the documented proof of what happened to the original Indians of the Yosemite area. They could've figured this out if they had asked the right people very early on. Lafayette H. Bunnell, one of the only men to meet Chief Tenaya or Tenieya, and write everything we know today about him, wrote in his book, Discovery of the Yosemites, that in 1853 the remaining Yosemite Indians, after being decimated, were taken back to Paiute Mono Lake and absorbed back into the Paiute population. Today Yosemite National Park employees believe that the original Natives of Yosemite were Southern Sierra Miwuks. So what does the name Tenaya or Tenieya mean in Miwuk? Since he was supposed to be their early chief. It should be easy to explain. I have never heard of their explanation of any definition of the word Tenieya, the most famous known chief of the Yosemite American Indians by those who claim him as their leader. 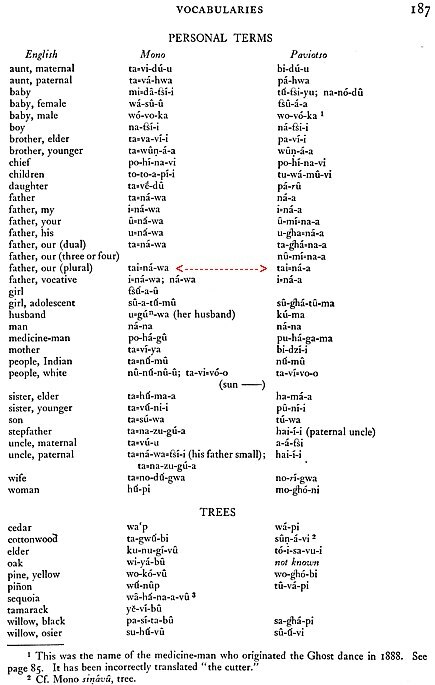 from photographer Edward Curtis' linguistic notes - Bishop Paiute and Mono Paiute words. Remember they made up the majority of Chief Tenayas band. Note the word for "Our Father" in the notes. Many times the chief of a certain band were called "Father" by the people in their band by the Paiutes. "Our Father" in the Mono/Bishop Paiute and Paiute language. Which looks like Te-na-ya or Tenieya. So it would make sense that Chief Tenaya's name was probably "Our Father" out of a sign of respect by the Mono Paiutes who made up the majority of his band...and not Miwuks. If they, the Southern Sierra Miwuk, have the definition for Chief Tenaya, we sure would like to hear...since they claim him as their chief. I have never heard of one...well not in Miwuk.